I’m in need of a vacation … from the vacation I just took. MrB and I like to spend our off-time in other cities, especially London and Paris. We wind up dashing from dinners with friends to the theater, from the theater to concerts, from concerts to museums. Last year, we got in some relaxation on Greek beaches after all the urban activity. This year, we missed the restful part, so now I’m back home, feeling like I need to go some place peaceful. Calgon, take me away! I did love every crazy minute of it. Our first appointment in London, on Wednesday, July 29, was with my gorgeous blogger friends Kate, Aly, Liz and Margaret. (We really missed you, Sharon!) I’ve been meeting up with bloggers in London since 2008. We (or I) like to drink Pimm’s, but it’s getting harder to find at the places where it’s convenient for all of us to meet. We settled for rosé wine, tapas and Nutella dessert pizza at Polpo in Covent Garden this time. 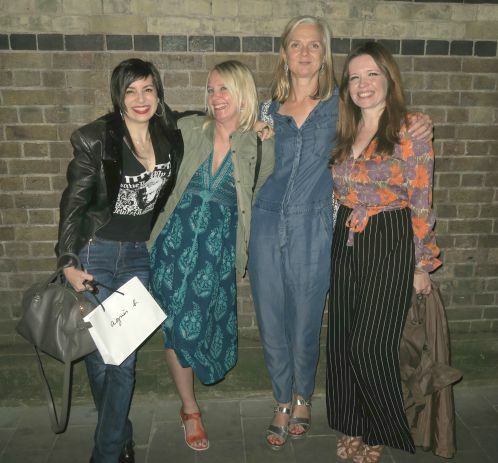 Me, Kate, Aly and Liz. Margaret had to leave early. 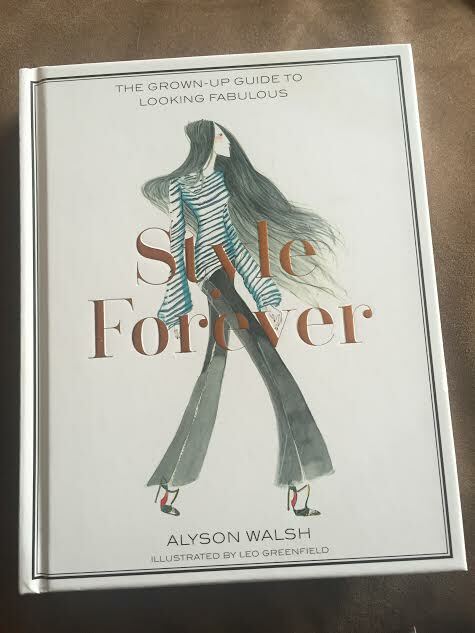 The Agnes B bag I’m holding in the photo contains my autographed copy of Aly’s adorable new book, Style Forever. I’m looking forward to throwing her a book party in New York this fall, when the official American edition comes out. But you can already buy the English version on Amazon. Click to purchase. It makes a great gift! 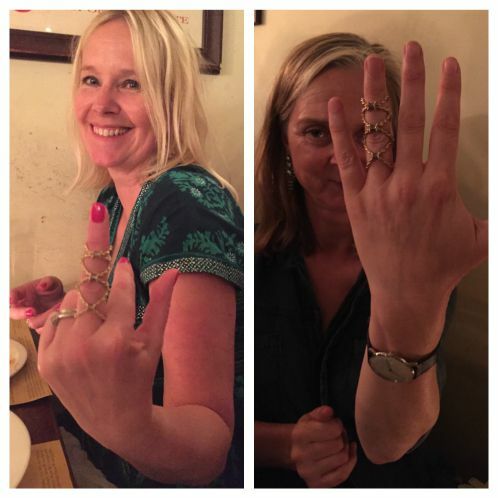 The ladies tried on my 18K gold, full-finger, barbed wire ring. Kate being sassy; Aly being shy. 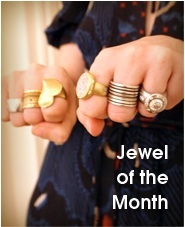 It looks so good next to Liz’s own ring! I went back to Covent Garden the next day to make my regular stop at the store Opening Ceremony. 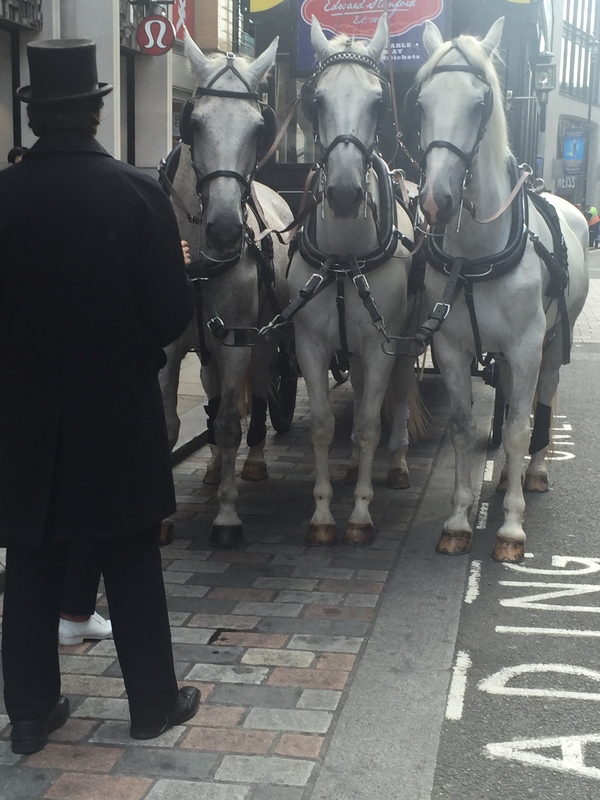 Seen on the way to Opening Ceremony. There’s an Opening Ceremony in New York, but I only seem to go to the one in London, where I buy lug-soled shoes. This time, I found an empty storefront for rent. Noooo! I kept staring at the space, waiting for my store to reappear. When that didn’t happen, I took out my phone to figure out a new plan, and I saw this tweet. I thought, “Hmmm. 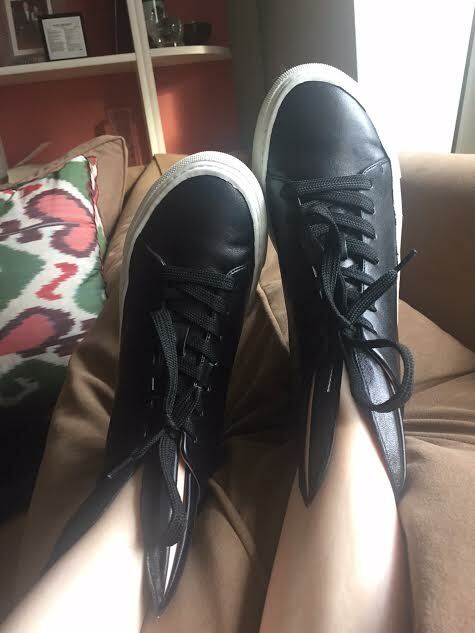 Sneakers with bunny ears,” and looked up where they were sold. Harvey Nichols. I grabbed MrB and ran off to Harvey Nicks. Voilà! As a bonus, the upstairs bar at Harvey Nicks makes a good Pimm’s Cup. 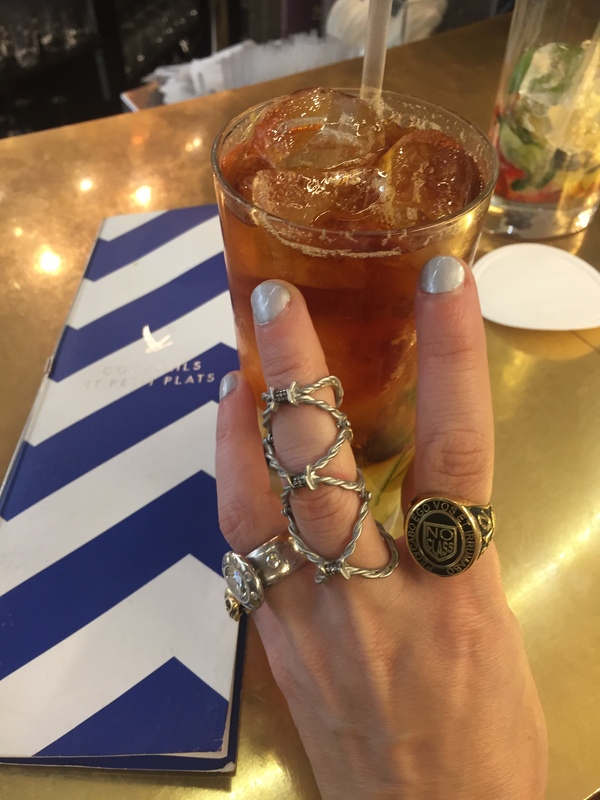 Pimm’s and rings at Harvey Nicks. That’s the platinum version of the full-finger barbed wire design on my middle finger. 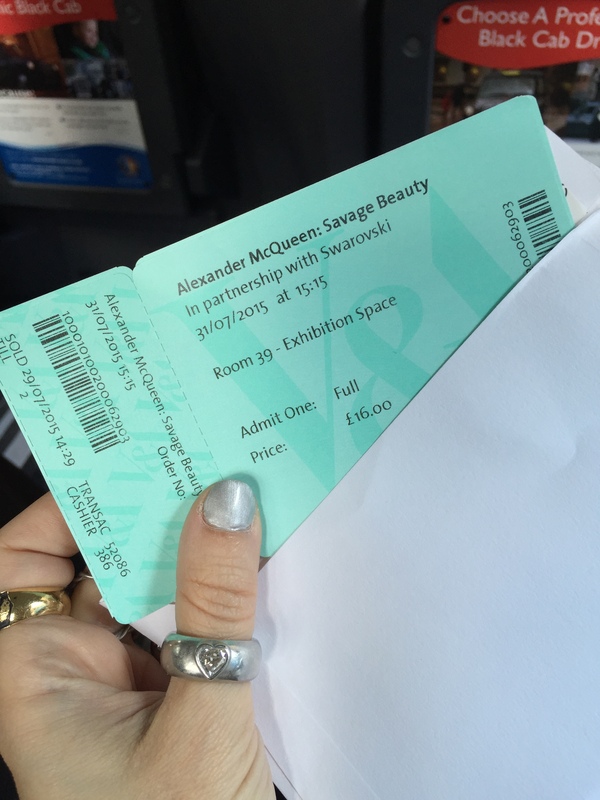 On Friday, we wangled tickets to one of the final days of the Alexander McQueen: Savage Beauty exhibit at the Victoria and Albert Museum. The exhibit was being kept open 24 hours a day due to demand, so, as a night owl, I was hoping to get some crazy 2 a.m. tickets, but ours were for the civilized hour of 3:15 p.m. Wearing my platinum and diamond thumb ring a lot lately. But it’s really a wedding-ring design! I missed this McQueen exhibit when it was at the Metropolitan Museum of New York in 2011, but it still changed my life. I had procrastinated about going till the final weeks, when there were three-hour lines to get in. It was August and there’s no shade in front of the Metropolitan Museum and I was just like, “Nope. Not waiting in the sun for hours.” Then I started to feel regret, but it was too late: I was going out of town for the last couple of days of the exhibit. I was headed to Chicago for Lollapalooza and I was so annoyed with myself for refusing to wait a few hours for an interesting McQueen experience that I overcompensated by waiting 9 1/2 hours to see Eminem from the third row. Since then, I’ve become an expert on waiting anywhere from eight to 12 hours to be in the first couple of rows at concerts big and small. I owe it all to McQueen. And, now I’ve finally seen the exhibit, so I feel complete. On Saturday, MrB and I did something else that we never got around to in New York: seeing Miss Saigon. The musical — set during the Vietnam war and inspired by the opera Madame Butterfly with a whole lot of Cabaret‘s Emcee thrown in — played on Broadway from 1991 to 2001. Over four thousand performances, and I didn’t catch a single one! In this case, I wasn’t very interested during the original run. I had heard the music and it didn’t do anything for me. But, because London theater was experiencing an August lull and nothing else intrigued us, we figured we’d check out Miss Saigon. Oh, okay, because you twisted my arm. I’ll see it. The actors were stellar, the singing was superb, the helicopter-evacuation special effect was impressive. The book and songs were “meh,” and, seriously, the character of the Engineer WAS the Emcee. I feel very strongly about Cabaret, and disapprove of anyone trying to bite its style. That said, we were entertained for the afternoon before we ran off to meet gorgeous jewelry blogger Monica Stephenson of iDazzle. 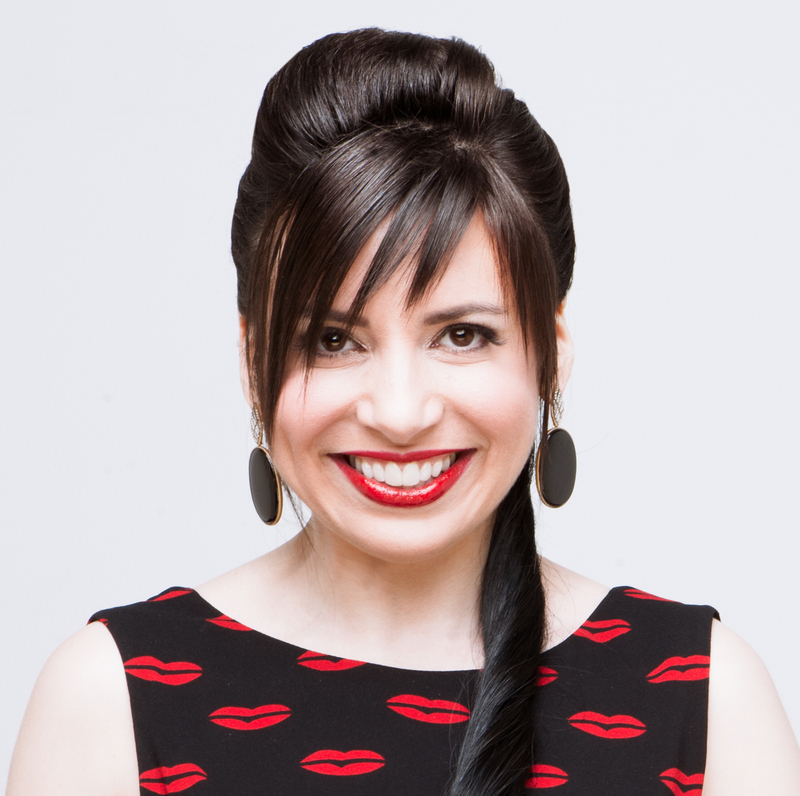 I had seen Monica five days before at the Women’s Jewelry Association’s 2015 Awards for Excellence Gala in New York, where Monica won the award for excellence in editorial media. 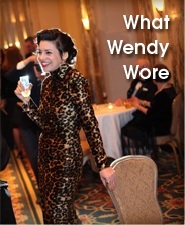 Getting all black and white at the WJA gala. 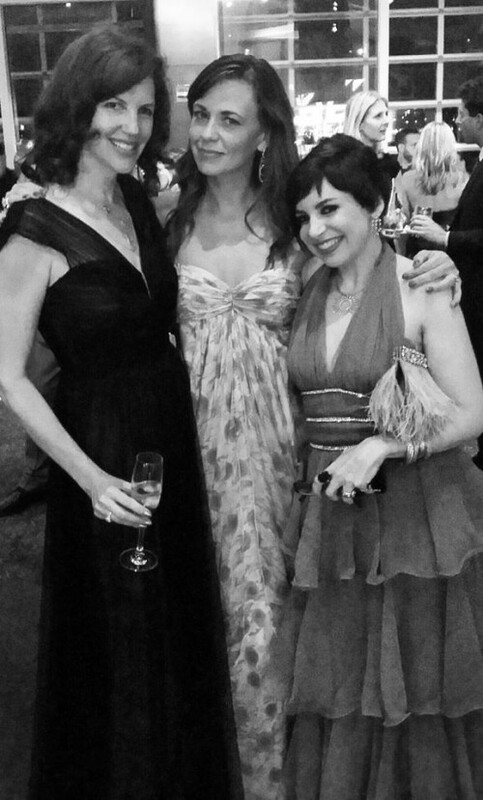 From left: Monica, our gorgeous friend Barbara Palumbo, and me. That night, she mentioned to me that her family was leaving for London the next day. 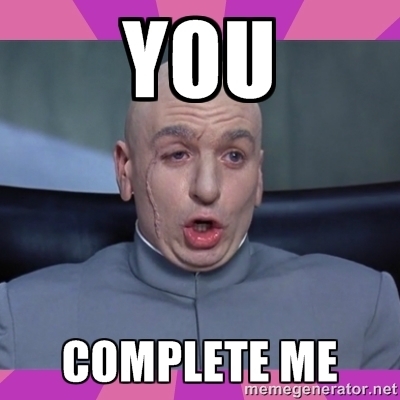 “So am I,” I said. “We’re on the 7 p.m. Delta flight,” Monica replied. “So am I,” I said. 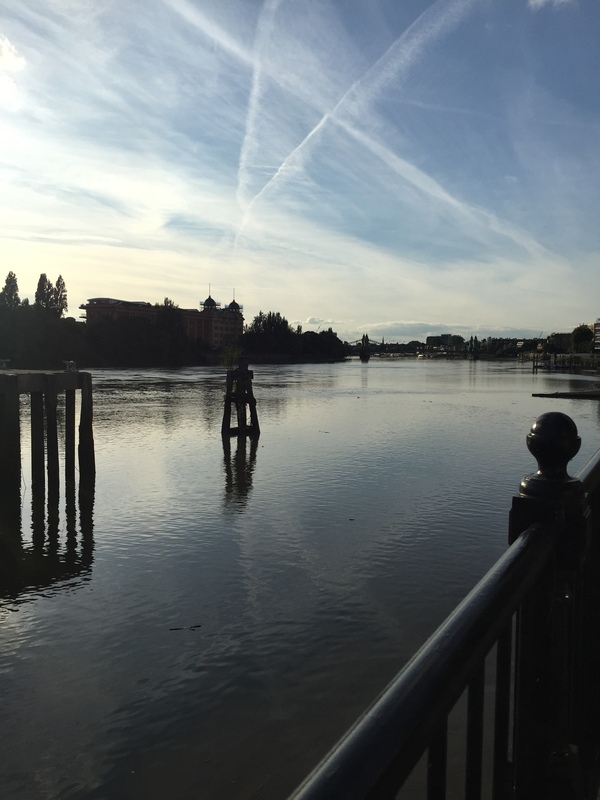 We got to say hi to each other on the plane and later made arrangements to have dinner at the River Cafe, next to the Thames. 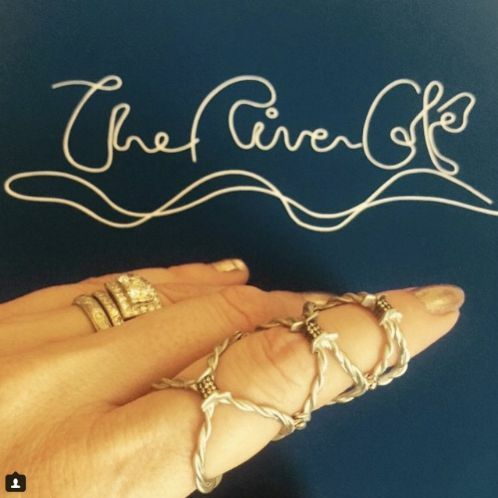 It makes sense to find a place called the River Cafe next to a river. During dinner, guess what Monica did? 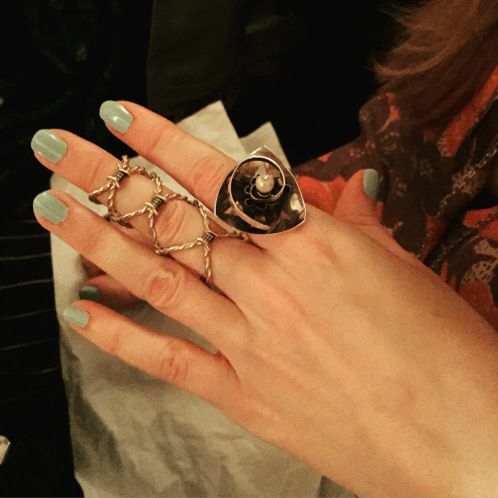 She tried on that full-finger barbed wire ring! Everybody tries on the barbed wire ring. This is the platinum version. From Monica’s Instagram. Click for source. We had a wonderful time with Monica, her husband, two kids and her mother. Here’s what I wore. 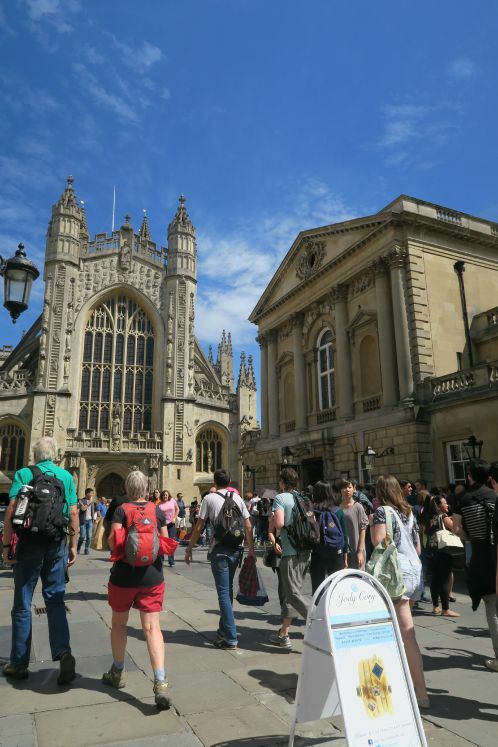 On our final full day in England — Sunday, August 2 — we followed suggestions to visit Bath, the spa town frequently mentioned by Jane Austen. The lesson I learned from Alexander McQueen and the Metropolitan Museum came in handy once again. There was construction on the train line that runs from London to Bath, and one train employee warned us that it would take three hours to get there. MrB and I were off to a late start, as usual, and three hours there and three hours back seemed like an ordeal. Then again, three hours was the expected wait time for the McQueen exhibit in New York. I realized the weather was beautiful, we had nowhere else urgent to be — having, in addition to all the above activities, already squeezed in separate dinners with two journalist friends and my Ossie Clark friend, Al Radley — and why not go to Bath? I am a big fan of Chaucer, after all. A souvenir. 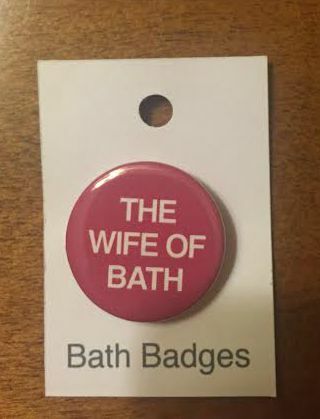 Click if you don’t know who the Wife of Bath is. The train took 2 hours and 15 minutes. Not bad. A view of the abbey at Bath. Bath is named for the Roman baths built around its natural hot springs, though ancient Celts and Britons also made use of the springs before the Roman invasion that started in AD 43. The site has been excavated and is quite fascinating. 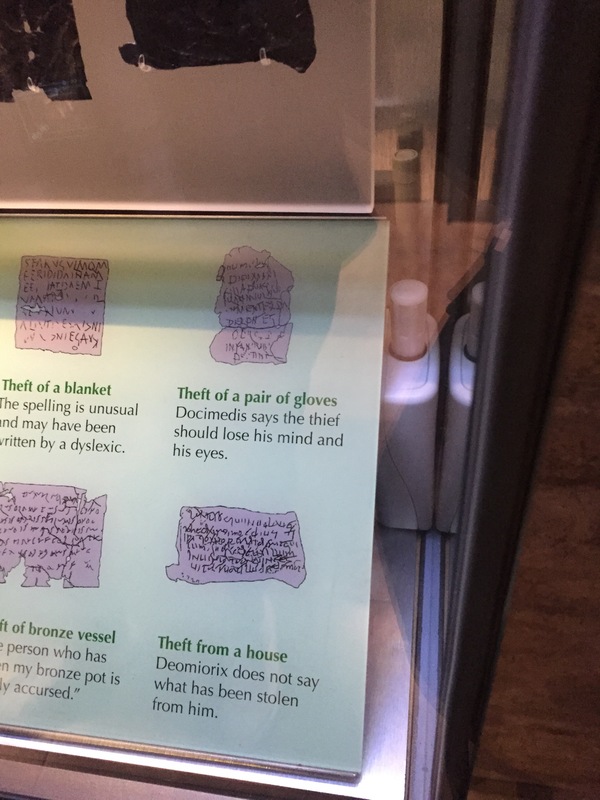 The Roman bath complex included a temple, and curse tablets are among the artifacts that have been discovered at the site. People inscribed their prayers for vengeance on lead alloy. I appreciated the one translated in the upper right corner of the photo below for the specificity and severity of the requested punishment. Click to enlarge. Also, I didn’t even notice the reference to dyslexia in the upper left corner until I looked at this photo. That’s what you get for stealing gloves. You’ll lose your mind and your eyes. Consider yourself warned. 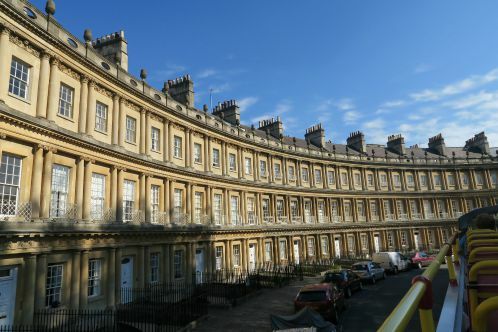 The architecture in Bath is beautiful and benefits from the golden glow of the local Bath stone. The whole city is a World Heritage Site. The Royal Crescent in Bath. 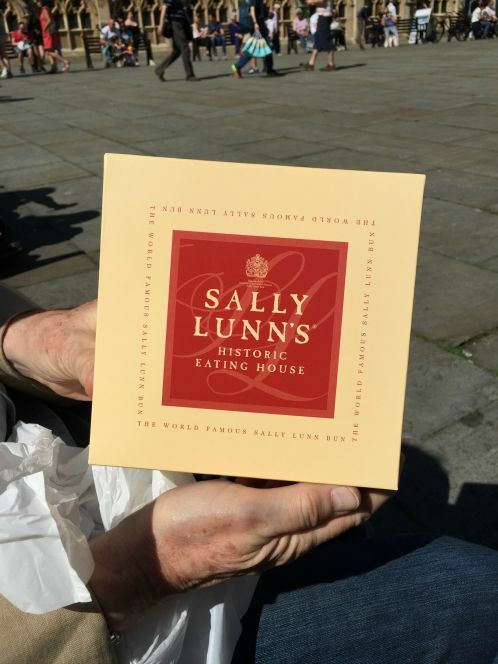 Before we took a bus tour with a sassy narrator, we stopped by one of the oldest houses in Bath, occupied by Sally Lunn’s Historic Eating House, to get one of the famous Sally Lunn buns. You can’t go to Bath without getting a Sally Lunn bun. The place was packed so we got a bun to go. 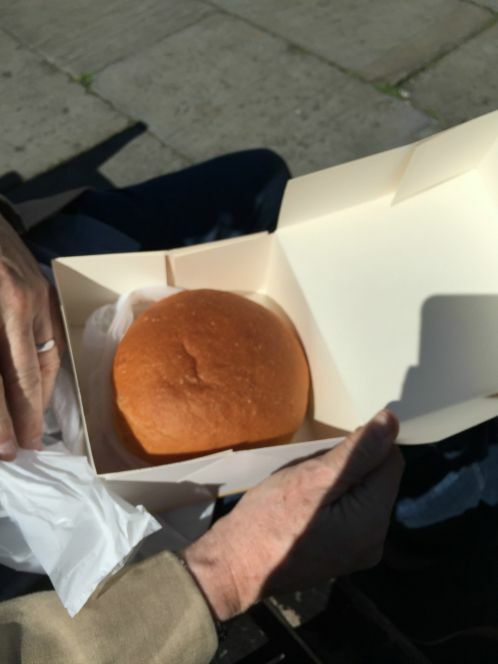 MrB holds the bun box in Bath’s square. The photo doesn’t do justice to the size of this thing. We returned to London that night from Bath and the next day we headed to Paris. (That will be my next post.) But before getting on the Eurostar, we had our not-three-hour train ride back to London, during which we decided that we had enjoyed Bath so much that we want to return. My hope for next year is to go to nearby Stonehenge first. 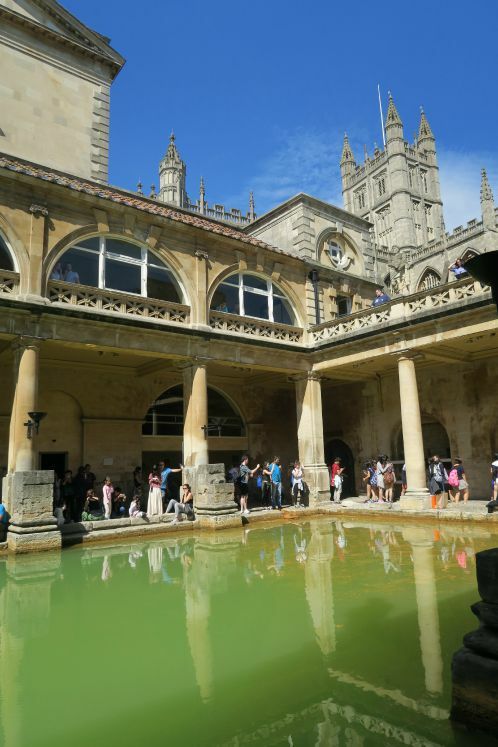 Then we’d go to Bath’s Thermae Bath Spa to “take the waters” like the Romans and Austen’s crowd; have a torchlit dinner at the Roman baths; and stay overnight at the Royal Crescent Hotel. I wouldn’t have this great plan if I’d let the gloomy train employee discourage us from going, and, again, my willingness to invest the time is due to the 2011 McQueen incident. Missing McQueen at the Metropolitan Museum is my own personal version of the butterfly effect. Oh, I think we’re going to have to add Bath to our next England trip! 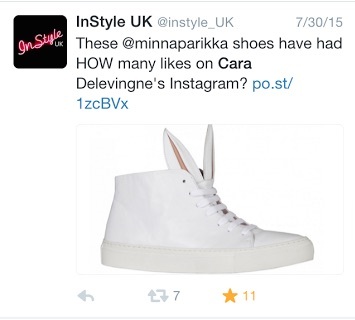 Love those bunny-ear shoes…so you. Ah, thank you for the shout out (Aly looking like she’s overindulged in the pink wine! ), so lovely to see you and Mr B. Glad you made it to Bath and to the McQueen exhibition – two wonderful things. My boarding school was 20 minutes from Stonehenge and, when I was going there, you could just walk up to the structure and sit on it. I love Bath (was our weekend trip town). I also think that trains in England are the best anywhere – and I take trains. The scenery is so gorgeous, as you go to Somerset, that it’s an entirely pleasant way to spend a day. Mind you, I’ll spend 6 hours on a train without giving it much thought. In a car, no way. Oh yeah, trains over cars for sure. Some people are so down on Stonehenge because of the masses of tourists, but that doesn’t matter to me. I’ve always wanted to see it. Did you get any Druid-ish vibes while you were there? Is swimming in the baths of Bath permissible? Asking for a friend. Not at the baths themselves but the spa there has a cool rooftop pool! That’s part of why I want to go back! Holy cow, what a post! Amazing pictures. I’ve got to order Alyson’s book! Congrats to her!! I keep looking at the group picture and chuckling over Kate’s “one-legged seagull” stance. That’s what it reminds me of! That’s a shame about Opening Ceremony. The way you kept hoping for the storefront to appear makes me think of opening the fridge, 1000X a day, thinking that something new will just suddenly show up. You have not introduced me to the Keith Haring dress yet! LOOOVE. Bath looks beautiful. Plus, it’s just one giant Calgon moment! LOL @ Calgon! Yes, Bath really IS like a tribute to Calgon.